There are many different things that people look for when purchasing a metal detector. The first, of course, is that it does a good job of finding metal in the ground, and in the case with most detectors, an accurate discrimination to separate the trash from the good targets. Beyond that, people’s needs vary significantly depending on the exact type of metal detecting they are doing, and finding the right metal detector means knowing your own requirements and finding the one that best fits them. For many coin and relic hunters, that metal detector is going to be the XP DEUS Metal Detector . The XP DEUS Metal Detector is a particularly versatile machine, and one which offers the user several technological advances not available in any other detector on the market. Most notable is the fact that it is completely wireless. No other company offers that. It’s also one of the lightest detectors available on the market right now, weighing in at only two pounds! This alone has made is a very popular detector for old and young detectorists alike who consider weight of their detector as a major selling point. Since it’s free of excess wires and bulk, it’s also easy to fold away, making it ultra-portable. For even more convenience, the XP DEUS comes in several different configurations, depending on the user’s choice of coil, headphones, and remote. The XP DEUS is the world’s first fully wireless metal detector… but what does that mean? It’s not like a metal detector usually plugs into anything right? It’s wireless in a way you might not have anticipated: All of the software for detection is built into the search coil. The search coil communicates with the Digital LCD Display Remote (which can be optionally mounted on the DEUS telescoping pole) and your audio headphones wirelessly. This provides the user with particularly clear audio, great battery life, and extremely high speeds. Instead of having a wire convey a signal from the detector to the display, which also houses the software for analyzing the signal, the signal is detected and analyzed near-instantly within the coil itself. This means you’re getting information about what’s being detected faster than with any other detector, which lends itself to much better accuracy. Furthermore, because the signal is completely digitized, you have the ability to adjust nearly every aspect of detection to your personal liking, including the power, target recovery, and reactivity. Thanks to this digital design, the XP DEUS might be the first detector that is truly all purpose. You don’t need to buy more than one detector just because you want to switch up your treasure hunting habits. Instead, you can adjust practically every element of how the DEUS works to ensure that it’s optimized for whatever you’re looking for, from coins to relics to gold. It has four different frequency options and ten default program settings. You can also customize your own program settings—in fact, you can save up to eight customized settings. So not only can you hunt for anything, the DEUS is easy for beginners to use and leaves you room to grow with its powerful advanced features. There are three ways to control the detector: by using the control headphones and remote together, using the remote alone, or using the headphones alone. The wireless headphones are weatherproof, and have a replaceable headband. The encompassed electronics can be used to control the most vital detector features, like frequency, sensitivity, volume, and ground balance, among others. The remote display can be mounted on your hip, carried in hand, or mounted to the telescoping pole. You can control every aspect of the detector, including its most advanced options, via the remote. The DEUS comes with a telescopic, foldable S handle stem, and a waterproof wireless search coil and coil cover. Wireless headphones and the remote display screen are optional—you can choose from multiple, different bundles when shopping for your own DEUS, depending on your needs. You can also buy accessories separately, if you’re not willing to invest in the entire kit from the get go or wish to replace a part. One of the best things about the DEUS is its ability to stay current. Thanks to the USB connection on the DEUS remote, you can update your XP DEUS Metal Detector’s software any time. This is particularly important for gold prospectors with the 3.0 version update, as we will discuss now. The XP DEUS has garnered considerable attention for one thing that it does extremely well; identifying non-ferrous targets that are surrounded by ferrous junk. Anyone who has done any amount of gold nugget hunting will understand the value of this. Some goldfields are notoriously trashy, and are virtually impossible to hunt with a traditional gold detector as the amount of targets is just too overwhelming. Now to some extent any good VLF detector will have some discrimination capabilities that will allow you to “cherry pick” targets while you are detecting. 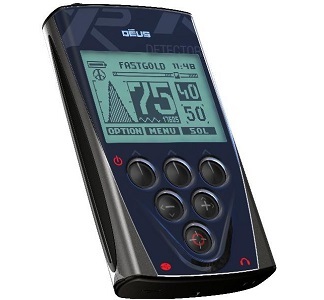 The difference between most other detectors compared to the XP DEUS is the ultra-fast processor of the XP DEUS. This allows the detector to hit on nonferrous targets that are completely surrounded by iron junk, a situation where most other detectors would not hit on the good target. Currently of all detectors on the market, it seems that the reactivity of the coils on the XP DEUS is unmatched, which is opening up areas that were once so trashy that prospectors would just walk past them. Have you ever detecting in an area like this? I expect if you have been gold detecting for any amount of time you probably have. The problem with doing this is that the trashiest locations were also some of the richest! The miners camped right on top of the gold, and they left behind all their junk right on top of the best areas. These areas can now be effectively hunted with the XP DEUS when it was all but impossible before. With the 3.0 version, and later the 3.2 version updates, the XP DEUS suddenly became a detector that was not only for use as a coin and relic machine, but also for use in the goldfields specifically to target gold nuggets. The goldfield program runs in all-metal mode, which allows it to be most sensitive to small target that are encountered in the goldfields. It is designed to work in the mineralized soils that are found in gold country and balance out the ground to runs smoothly even in the harshest ground conditions. The XP DEUS in prospecting mode can also be run with its unique IAR discrimination, which will actually blank out large shallow ferrous targets while detecting normally at deeper depths. This allows the large, shallow iron which is so common in the goldfields to still be rejected while being able to hear a good nugget underneath. This is an amazing feature that opens up many areas that used to be avoided by most prospectors. Headquartered in Toulouse since 1998, XP is one of France’s premier developers and manufacturers of metal detectors. They pride themselves on creating detectors that are consistent in their ability to perform at a high standard, while still incorporating new and innovative features. Since its release, the XP DEUS has had a huge impact on the market. It is rare that a new metal detector comes along that is truly revolutionary, but the XP DEUS undoubtedly did! The brilliance of this detector is how well it functions in so many different conditions. It is easily one of the most popular detectors on the market now and competes with only a few other select high-end detectors as what most would consider being the best on the market. For gold hunters, its unique discrimination and fast response time allowing for quick target separation makes it a very specialized unit that belongs in your detecting arsenal. It can’t be beat for trashy old mining camps and rubbish infested areas.